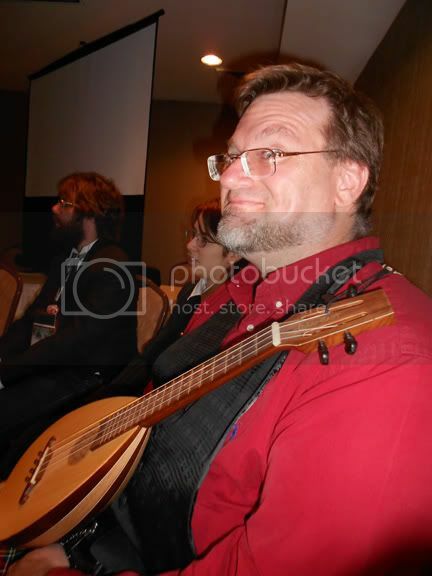 Monkees toted his ukelule to Wisconsin to practice, so when we decided to go to the filk sing he rewrote Black Leather Band, one of the songs he's been practicing, to be about a night with the Seamstress Guild. It was a good thing he was able to come up with a song so quickly and that he had his uke with him - no one else brought any instruments. When we showed up someone excitedly cried out "A musician!" Monkees quickly denied that and warned he only had the one song. But his was one of the few songs about Discworld and one of the few written by someone in the room, so it went over rather well! The makeshift host of the room was quite happy. We weren't there from the beginning, but apparently the convention put Filk on the schedule without assigning anyone to run it or do room setup. Thankfully there were some older and experienced filkers mixed win with the all-aged crowd, so they got the group in a circle and made sure everyone got a turn to speak or sing. Only a few people actually sang, though. A Nanny Ogg look-a-like had a book full of songs and a jolly attitude - she didn't have any Discworld songs but she had traditional filk songs that were retrofitted to be DW. Oh, and she sang a song Three Quarter Ale sings! Some people led the entire room in JoCo songs. Someone sang in another language - that was interesting. I sang a Boogie Knights song, Leonardo, in honor of Leonardo de Quirm. A guy pointed out a filk song in the convention book - We Didn't Steal The Fire - and the group sang that together - which was super fun. and have wow-wow sauce at tea. I like to shout Bursar!!! I give out knowing winks. JoCo plays Uke, too. The group sang Re: Your Brains and Future Soon. What's that duck doing on his head. What duck? * Nanny Ogg in the middle. 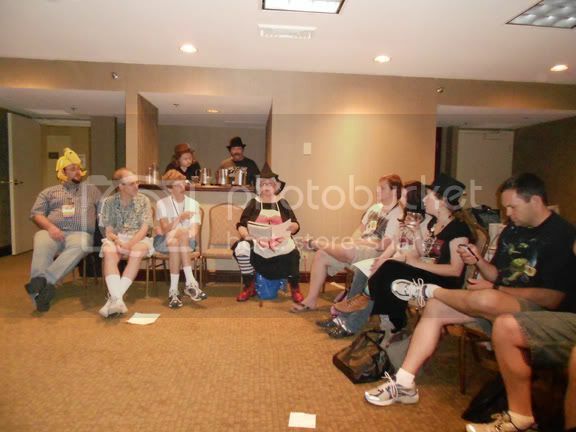 I posted some JoCo related Discworld pictures on the JoCoGo journal. Woohoo! I want to do a version of I Am The Very Model of a Modern Major General to be about the Patrician. It has such cool rhyme potential - tactician, submission, ambition, etc. My husband and I want to rewrite He's Got The Whole World In His Hands as He's Got the Whole World On His Back. He had an even better idea for a song, but I cannot think of right now, darn it. He only had the first line and it already had me laughing. The Arch chancellor song is a fairly rough draft - I'm not particularly happy with the 3rd voice, but I don't have any better ideas. If you have any suggestions I would appreciate it!